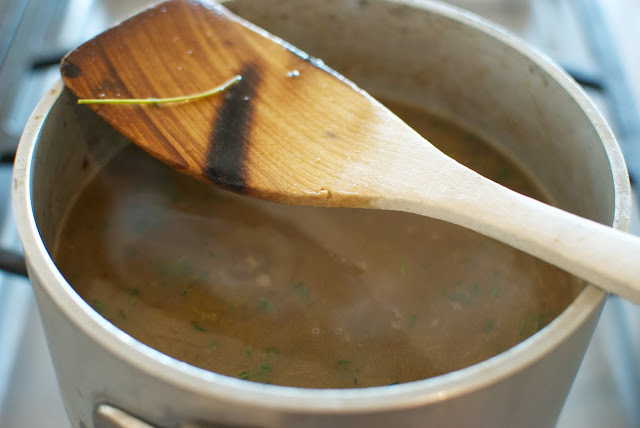 Sweetpea-Lifestyle: French Onion Soup... Finally! Excuse my absence.... It's been a busy last several days! Where were we? Oh, yes... 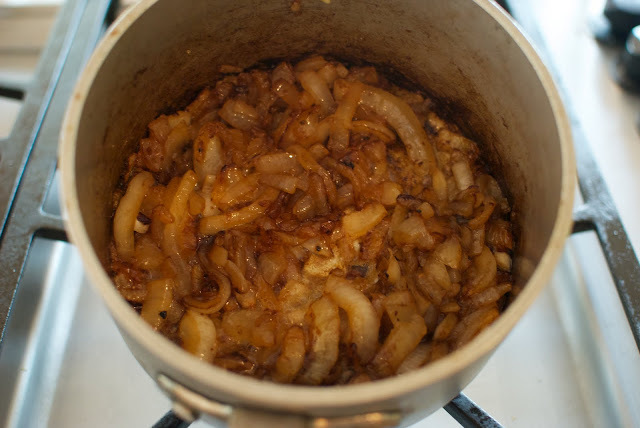 I had told you I would show you how to make French Onion Soup. Now, we need to add some wine to 'deglaze' the pan.... In other words, scrape up all those yummy brown things on the bottom of the pan. 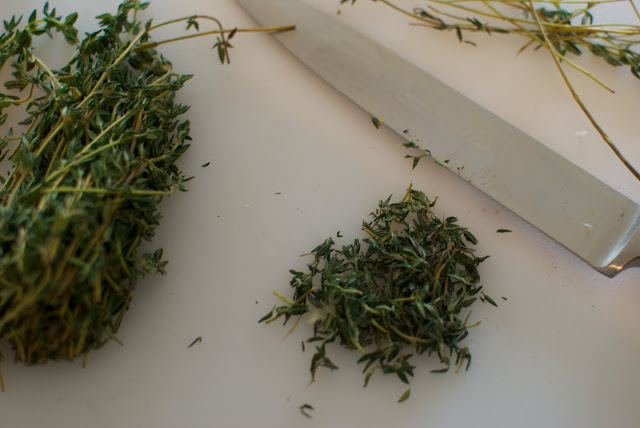 Next we need to add some minced fresh thyme, about two tablespoons, or, to taste. Tip: You can just add the stems (tied with string!) straight to the pot, the leaves will fall off into the soup as it cooks. I did not do that, as you can see! 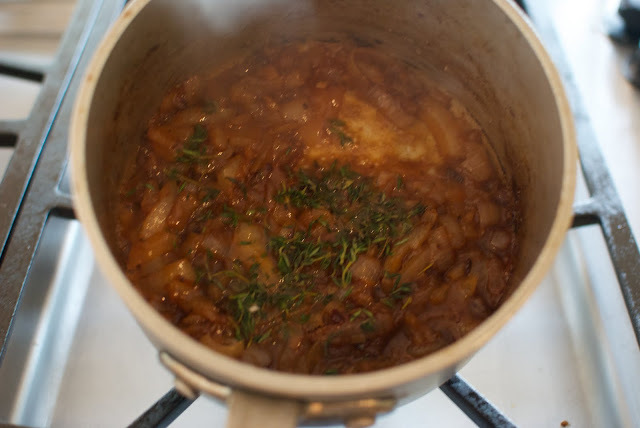 So, now stir in the thyme, and you are ready to add your veggie/beef broth combo..... (I didn't photograph that part.....sorry!!) It's one part beef broth (1 cup!) to two parts vegetable broth (2 cups!). See the stem? You can fish out any that you accidentally throw in! Now, you are ready to serve! Here is the recipe so you can copy/paste it into a Word Document. 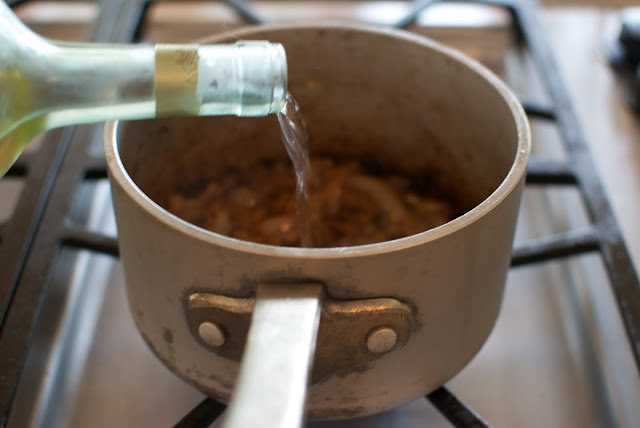 Deglaze your pan with the wine, and add the thyme. Pour in liquid, and simmer for 15 minutes. Serve immediately! Falling down on the job? Yes. Big surprise coming? Yep! With a GIVEAWAY!